Feed Our Food Insecure Neighbors with the Verdi Posse! Verdi Posse serves dinner to 200-300 food-challenged guests weekly. We are one of three FaithWorks projects here at UUFNN. We’re out there building plates of real food each Wednesdayat 6:30 at the Record St. campus (335 Record just off Fourth St. east of Virginia St., downtown). Serving takes from 45-70 min, depending. No reservation or training needed; just show up. Park in the parking lot and watch for gathering people and a white van. We serve outside. Join us! We are blessed to receive all kinds of donations. A helpful donation is “pocket food”, wrapped bars, etc. that can be pocketed for later. Hard-cooked eggs are always wonderful! Make a casserole; bake a cake. It’s easy! Thanks to our donors – Always! We also take clothing and books. For more info, to do a task, or to join our mailing list contact office@uufnn.org. 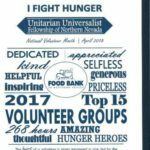 Northern Nevada Food Bank UUFNN is recognized yearly for our dedication to helping at the Northern Nevada Food Bank. The work shift is once a month on a Saturday, and you can meet in the Fellowship’s parking lot for carpooling. Contact office@uufnn.org to arrange carpooling. Our dates for the rest of 2018 are May 19th, June 23rd, July 28th, August 25th, September 22nd, October 20th, November 17th and December 22nd. Immigrants Welcome! UUFNN currently supports two refugee families-a family of 6 from Syria and a family of 4 from the Congo. We also are helping find mentors for other refugee families in the resettlement process. If you are interested in finding out more, email the Northern Nevada International Center at nnic@unr.edu . Gift Cards We are always accepting gift cards for community members needing a little help. If you would like to deduct these gifts from your taxes, please put your name on an envelope with the gift cards inside. And if you ever need a little help, let us know! 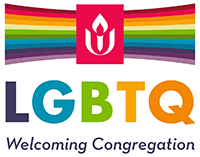 Contact RevKaren@uufnn.org or our pastoral care team for confidential help.